The ADS-429 is a 12-bit, 250kSPS multi-channel SAR Analog-to-Digital converter housed in a 16-pin plastic TSSOP package. It is the best choice for all military, airborne, and aerospace applications that can utilize a low cost Commercial Off The Shelf (COTS) component such as the ADS-429. 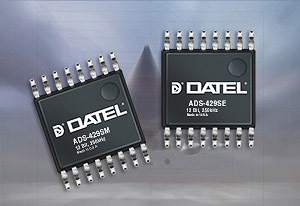 DATEL, Inc. has announced the introduction of the ADS-429 series, a new line of multi-channel Analog-to-Digital converters that offer 12-bit resolution and are housed in a 16-pin plastic TSSOP package. It is offered in two enhanced Commercial Off The Shelf (COTS) grades, ADS-429SE (-40 to +105°C) and ADS-429SM (-55 to +125°C). Each unit features no missing codes, ±0.5 LSB of Differential Non-Linearity, ±0.5 of Integral Non-Linearity and is 100% tested for performance across one of the two temperature ranges: -40 to +105°C; -55 to +125°C. The ADS-429 requires only one supply voltage for operation ranging from +2.7 to 5.25 Volts and consumes only 3mA of supply current. It has a sleep mode feature that consumes only 8uA of current. It is the ideal selection for low power and battery operated multi-channel Data Acquisition Systems. The ADS-429 offers a unique architecture that includes a sample-hold, a successive approximation A/D, and an SPI compatible serial interface. It features an excellent signal-to noise ratio (SNR) of 73dB and a total harmonic distortion (THD) of -85dB, which makes the ADS-429 the ideal choice for both time domain (imaging, telemetry, process control) and frequency-domain (radar, telecommunications, spectrum analysis) applications. DATEL offers these converters fully tested over temperature with ATE results recorded and stored for the operating temperatures of -40 to +105°C (ADS-429SE) or -55 to +125°C (ADS-429SM). Burn-in, lot and ATE traceability are also offered. Samples for both ADS-429SE and ADS-429SM are available upon request. For the more demanding and ruggedized application, DATEL also offers this family of products as fully screened high reliability ADS-429-QL and ADS-429/883 models. These two MIL-STD models are offered in a hermetically sealed ceramic package to protect the IC from the effects of moisture/outgassing and to isolate the IC from the stresses that may occur on the printed circuit. Please contact DATEL for more information on these models. In addition to our standard product offerings, DATEL is a leader in providing System in a Package Solutions (SIP) for all special applications and Pin-to-Pin replacements for any existing or obsolete component. DATEL is an employee owned US-based company that is dedicated to the military and aerospace market solutions. For several decades DATEL has worked closely with defense and Hi-Rel companies to provide fully qualified and MIL Certified 883 components that meet customers' specific and stringent application requirements.